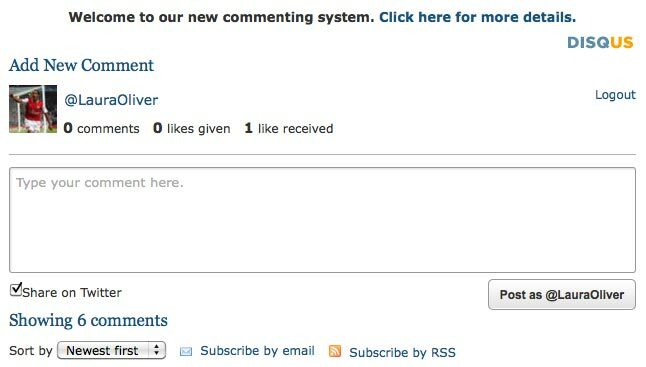 The Independent has installed a new commenting system on its website in the shape of Disqus – the same as we use on Journalism.co.uk no less. The system allows users to login to leave a comment using a Disqus profile, but also, and more importantly, with their Twitter username and password, Facebook login or OpenId identification. With the Twitter and Facebook logins there’s also the option to share your article comment via these sites. Jack Riley, digital media editor at the Independent, explains in a blog post that the new system has been trialled on the site’s sport section for the past week and has improved the level of “constructive debate”. We’re encouraging people to use credentials linked to their personal profiles not just because openness and accountability are great, fundamental things which underpin good journalism as well as good commenting (and why should the two be different? ), but also because by introducing accountability into the equation, we’re hoping the tone and standard of the comments will go up (…) It’s about first of all letting people authenticate their commenting using systems with which they’re already familiar (in Facebook’s case, that’s 400 million people worldwide and counting), and secondly, it’s about restoring your trust in our comments section, so that some of the really great submissions we get on there rise to the top, the bad sink to the bottom, and the ugly – the spam and abuse that are an inevitable adjunct of any commenting system – don’t appear at all. This entry was posted in Online Journalism and tagged Disqus, Facebook, Independent, Jack Riley, Twitter on May 25, 2010 by Laura Oliver. First we lost Disqus comments a week or so ago on most of the older postings, which I was informed was the result of a tachnical glitch – but they were never restored. Now, today, there is no comment facility on ANY of the current articles in the Independent, and again, all previous posts have been stripped of comments. It’s as if Disqus had never existed, which is, to put it mildly, bizarre – and hardly calculated to create or maintain a feel-good factor between the Independent and its online readership. How about a word of explanation on the Home Page – or do I have to email the Editor – again?